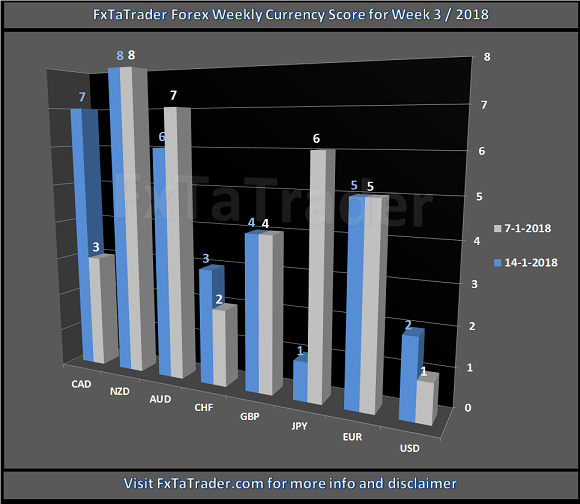 The Top 10 of the Ranking and Rating list for the coming week shows the following stronger currencies being well represented for going long: the NZD(5X) followed by the AUD(2X). 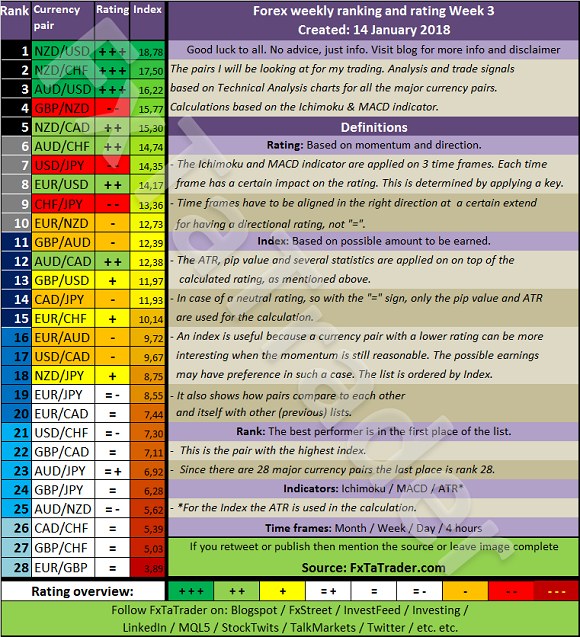 The weaker currencies are the USD(4X) followed by the CHF(3X). Neutral: USD and AUD. The preferred range is 4 to 5. Weak: JPY, NZD and CHF. The preferred range is from 1 to 3. The Chart for this week is the AUD/USD 8 Hour chart and the set-up is a Long Entry. Price is clearly in an uptrend and broke through the latest highs from October 2017. Support is expected around this level. A nice buy opportunity would be on the pullback towards the Kijun-Sen and the yellow dotted horizontal line which seems to be a good Support/Resistance level being at the level of the highs from October 2017. The PSAR should be positive in the Daily chart and favorable for long trades in the 8H. chart. It is positive in the Daily chart and even if it turns negative in the 8H. chart it is in favor of long positions. The AUD is a Neutral currency and the USD also. The Currency Score Difference is 6.